Hinkity Pinkities are brain teasing, word riddles that help students learn to interpret data, make inferences, draw conclusions, and analyze new information. All the while, they are working with vocabulary, synonyms, definitions, parts of speech, and honing rimes. What could be better than a fun way to work with Bloom’s Taxonomy? 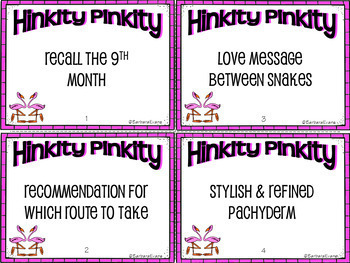 Hinkity Pinkity clues seek a 2 word answer. ❖ Each answer word must have three syllables. ❖ The 2 words must rhyme. 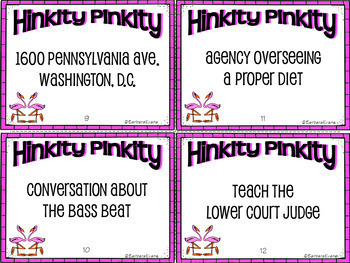 Clue: 1600 Pennsylvania Ave., Washington, D.C.
❖ Place an appropriate number of cards at a literacy center. ❖ Use a few clues as a warm-up activity. This is especially helpful if you conduct a pull-out program. ❖ Employ Hinkities Pinkities as a sponge activity. ❖ Fast finishers love to work with these challenges. ❖ Post several clues each day and train your students to use them as an anchor activity. ❖ Add this product to your repertoire of Higher Order Thinking Skills (HOTS) activities. In order to ensure your students’ success, begin by solving several as a whole group, demonstrating the thinking that leads to the solutions. ► Be the first to know about my new discounts, freebies and product launches. All new products are 50% off for the first 48 hours.